“Hello, world. Where’s Mom?” . . . .
We had a very prolific year with our guinea flock. And the hens did it all on their own, with no assistance from us. 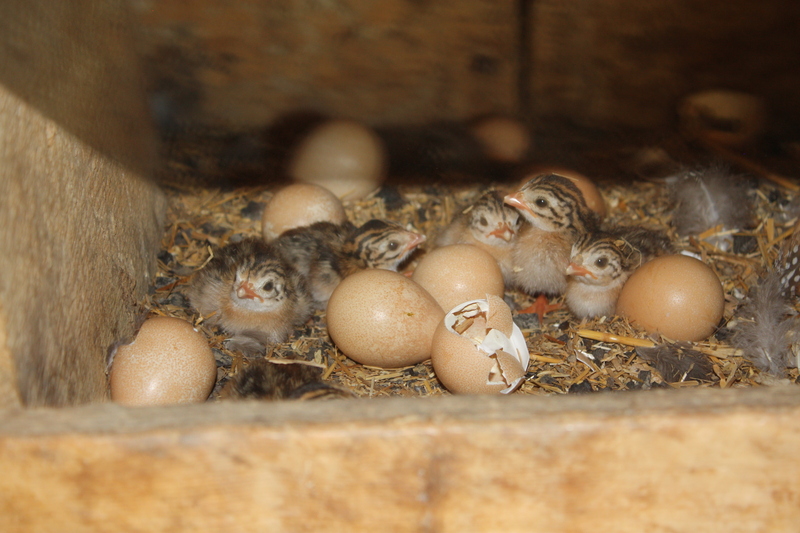 This group were lucky to be hatched inside one of the nesting boxes in the old chicken house. Two other batches were hatched “in the wild” hidden down in the creek bottom. We discovered a swarm of babies barely a day old running through the grass. Two Guinea moms had done the tag-team duty of sharing a nest and were they successful! We counted 16 tiny little fluff balls darting around and our attempts to catch them and bring them in to “safety” to be raised in the rabbit cage proved elusive. We did finally manage to gather up 14 of the keets from three separate batches and share them with a nearby ranch family who wanted to raise them. “one, two, three–where is everyone else?” . . . .
From the moment they hatch, guinea babies are on the move and can dart through the grass like greased lightning. The hens go about their daily routine, traveling through the fields, the barnyard, up into the hills and beyond. The little ones are expected to keep up. They are so tiny they are largely invisible, moving along in a brown tide barely stirring the blades of grass. We watched from a distance, certain they would be gobbled up by predators. We noted how they were accepted into the entire flock and how they all traveled in a tight-knit group. When we introduced keets we raised separately from the flock the previous summer, the adults pecked at them and did not immediately accept them. 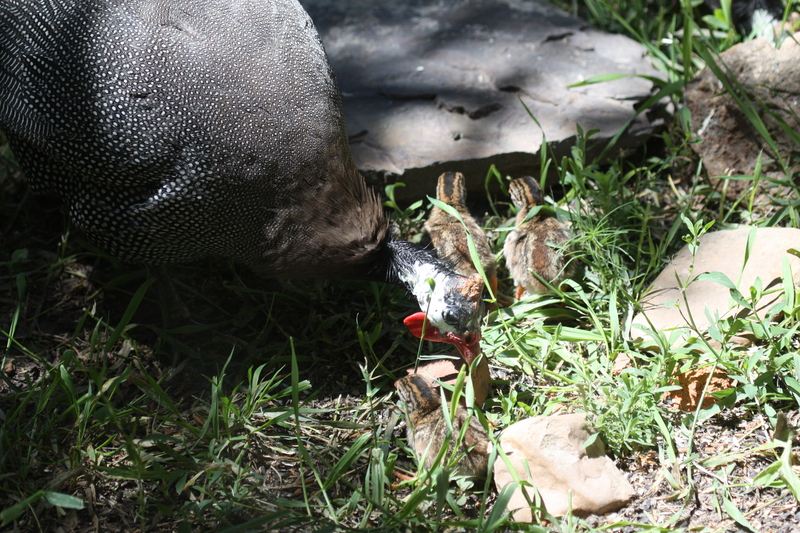 These baby guineas thrived in spite of our failed attempts to bring them in to safety. As they grew to become indistinguishable from the adults, it became apparent we had a problem. Too many guineas! With winter coming, we planned to move them into a smaller abode which would accommodate about a dozen total. We inquired whether the family who had previously taken the babies would like to have some adult birds. When they agreed, we were suddenly faced with two questions: 1) How would we catch them? and 2) What would we do with them once we caught them? glorious guineas . . . . I remembered helping my grandmother catch chickens that she planned to butcher. It was simply a matter of going with flashlights into the chicken house, selecting the birds she wanted, grabbing their legs and putting them in a gunny sack. I helped her with the butchering a couple of times, and quickly decided this was not my cup of tea. I had to hold their legs, lay them over a chopping block and she cut off their heads. I watched in horror as they spun around in a crazy dance, spurting blood, without their heads. But I digress. 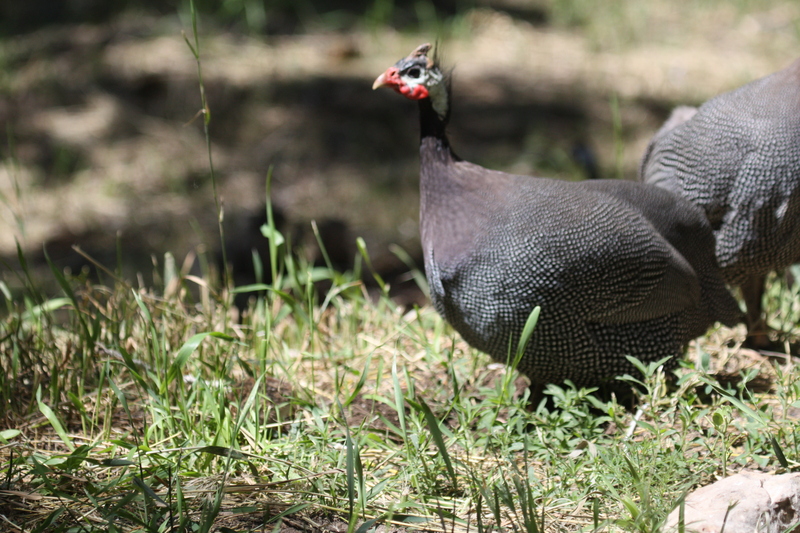 Catching the guineas would be easy–we would simply go into the chicken house– after dusk– with flashlights– grab some off the roost– put them in a wire cage we borrowed from neighbor Tom– and call the people who agreed to take them off our hands. Guineas are another matter. They do not allow you to come into their house, after dark, with flashlights, and grab them off their roosts! They fly. Everywhere. Bouncing off the ceiling, the walls, the windows, off us! Running into corners, under the roosts, under the nesting boxes, everywhere out of reach, faster than we could move. Stirring up dust so thick you could not distinguish the birds flying at you, near you, away from you, behind you or over you. A tornado of dust whipped up by whirling dervishes, so dense you could not breathe! Gasping and choking, we were able to capture eight birds and place them in a jail of sorts to be taken away. As we waited for the new owners to arrive, we went to wash up. The whole episode left me sad, and tears streaked the dirt on my face. I felt we had broken a trust with these wild creatures we invited to make a home with us. I remembered how excited we were the day we picked up a box of baby guineas at the post office, and the trials and tribulations we went through to raise them successfully. We were too successful! The whole episode was traumatic for us, knowing as we did that we had put the guinea fowl through a terribly frightening experience. Our only comfort was the knowledge that our guineas were going to a good home. It is our hope we gave away all our roosters! Very sweet story, filled with the delights of country living. Wondering how those geese are doing. Fred and Ethel still around? Fred, Ethel, Ricky and McGill have a new home for winter and are quite happy!